A bathroom is a multifunctional space and is an important addition to any home. Besides the shower and toilet, a sink is an integral fixture in the space, used by everyone for tasks like brushing one's teeth to washing hands. This is why choosing the right sink for your bathroom is a decision that you shouldn't take so lightly. Having the right sink and matching faucet in your bathroom can make your everyday hygienic activities go a little easier. 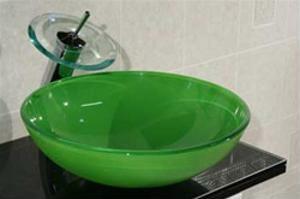 Are you looking for a deep sink that you can fill with water for shaving? Perhaps a vessel sink is the right choice for you. This raised option is not only handy, it's also seriously nice to look at! Besides your needs, take your existing bathroom vanity into consideration. If you're replacing an old sink and there's already a hole on the countertop, then you might want to get a new piece with the same dimensions. Additionally, it may be best to keep the style of the bathroom vanity in mind so your new sink won't look out of place.